This item is a pop-up relief valve known as a Pop-Up Drainage Emitter mounted on a 3" elbow fitting. This is a normally closed valve that will "pop-up" once drain pipes fill and pressure builds to release excess water from your drainage system. Once the water is discharged, the pressure drops, a stainless steel spring automatically retracts and the cover is closed to a flush position. The flush design of the product ensures that it blends well into the surrounding area. A drainage relief valve plus elbow is typically used at the discharge end of drainage pipe. 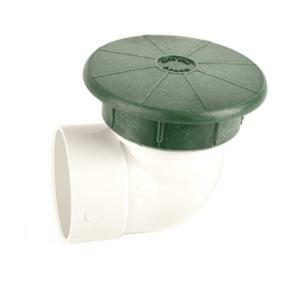 Elbow hub fittings attach directly to 3" Sewer and Drainage pipe and 3" Triple Wall pipe. Can be installed in either a vertical or horizontal position.